Confessions of a conspiracy theorist | Trust the Toffs! Journalists are often accused of being obsessive, irresponsible, badly supervised, out of control, obsessive again, prone to ka-razy conspiracy theories, ornery, really bad dressers, mouth breathers, showing poor table manners and did I mention something about wretched conspiracists? Into every life a little criticism must fall. For example in my case here, here and here from News Corp. Also behind the News Corp paywall, here and here. And that’s just in the last week, triggered by this modest effort by me on page 8 of the AFR. It’s entirely appropriate to call journalists to account. If they criticise something, are there any consequences, are the stories ever validated? Exactly what if anything does a story achieve? Without wishing in any way to detract from your right to apply any of these natty aforesaid adjectives to me, the following is a part of of my track record. Of course this is also an excuse for shameless self-promotion and narcissistic aggrandisement. You might want to hold a bucket. This hurts me more than it hurts you. Really. Besides covering News Corporation (see final section below), my other recent areas of focus have included the never-ending Offset Alpine saga and the alternate universe associated with it that keeps bubbling away; Eddie Obeid’s rural idyll on top of a coal tenement; and international tax avoidance cases, including finding Heinrich Kieber. 1. 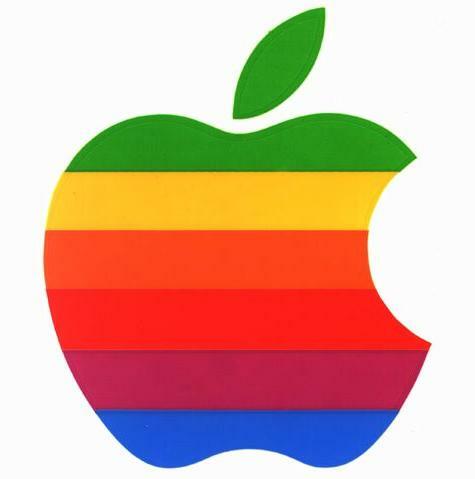 February 2014: Investigation for AFR reveals Australians have spent $26.7 billion buying Apple products since 2002, on which Apple paid $193 million, while it moved an estimated $8.9 billion of Australian income to Ireland where it was tax-free. First hard numbers on the Apple/Irish profits from Australian sales. Outcome: A lot of unhappy words from politicians. Big on the breast beating and hand wringing as well. It’s the complete exercise program. power in Senate and revealed background feud between former National Party organisation and former Liberal Party politicians which produced splits in LNP and led Palmer to found his own party after donating $3.4 million to the Coalition; and in particular the disagreement between lobbyist Santo Santoro and his mystery backer, and Palmer. Despite questions over his wealth, CITIC Pacific has an outstanding offer to pay $US200 million to increase its rights to Palmer’s ore deposits. 3. March 2013: Revealed Australia’s top 100 companies spent $3bn over past 2 years buying shares for execs without having to reveal the share trading at the time, which in small companies may affect the share price, revealed in Ownership Matters report. Outcome: ASX proposes new rules for daily reporting of share purchases for executives. A campaign by industry groups forces the ASX to back down and instead recommend annual disclosure. 4. February 2013: I approached Senator Arthur Sinodinos with questions over a 5 per cent shareholding in Australian Water Holdings which he had previously been reported as saying was being held for him by AWH chairman Nick di Girolamo under a “gentleman’s agreement”. I asked if these shares were linked to a parcel of shares referred to in documents before the Independent Commission Against Corruption. ICAC had filed a signed heads of agreement in which di Girolamo agreed to sell half of the AWH shares he held to the family of Eddie Obeid. The deal was signed the day after Sinodinos became chairman of AWH. The Obeids had said this deal was never consummated and instead referred to a loan to AWH. Outcome: Senator Sinodinos asked for more time to respond. He then announced he had given up all entitlement to the AWH shares, which were worth up to $3.75 million. He disputed this valuation. 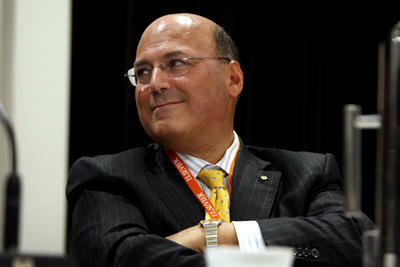 Sinodinos said he had no knowledge whatsoever of the Obeid links. He was not aware of donations ot the Liberal Party when he was a director, at a time when he was also treasurer of the NSW Liberal Party. He said donations were handled by the party secretariat. 5. November 2011: Angus Grigg and I revealed how a long-time non-profit organisation, the Bread Institute, which had enjoyed financial support from the government and the CSIRO since the 1950s as a key research role for the grains and baking industries, had been taken over by three men who turned it into a private company which they owned, which held $50 million property development. Outcome: The story triggered outrage in the industry and funds were donated to bring a legal action in May 2013 to challenge the takeover of the Bread Institute assets, seeking to restore them to their original purpose, just as a second high-rise office tower was to go ahead on the land. 6. May 2011: In 2010 I worked with Angus Grigg to show Nathan Tinkler had turned $1 million into $400 million in 15 months. In this piece with Angus I detailed how Tinkler had made a second fortune but in the process had become overstretched. 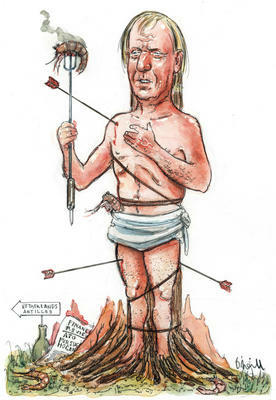 He was now making more risky billion-dollar investments but had mortgaged everything except a $54 million share parcel. While Tinkler was still being valued at $1.18 billion, it was the first story to call time on the coal baron. Outcome: After colourful descent in June 2013 Tinkler’s main financial backer, Farallon Management, seized his largest remaining asset, a 19 per cent share in coal miner Whitehaven. 7. May 2011: With Fiona Buffini, Hannah Low and Matthew Cranston. 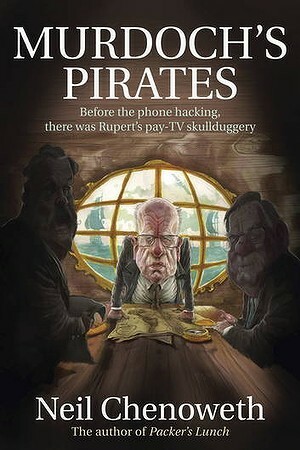 Three-part 13,000 words definitive account of Project Wickenby tax investigation reveals ATO played key role in deal for Leichtenstein whistelblower Heinrich Keiber to provide tens of thousands of banking records to tax authorities around the world. The story, “Would you trust this man?” quoted transcripts of Kieber’s interrogation and revealed Kieber was settled in Australia. The series also detailed the links between groups fighting the Wickenby laws. 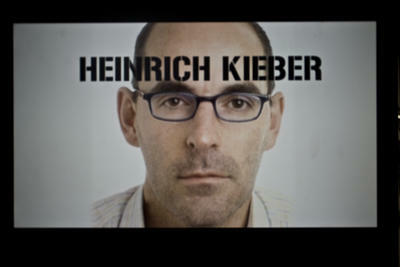 Outcome: On the morning of the May 2011 AFR story on Heinrich Kieber, residents of a Gold Cost café recognised him reading the story. Within minutes he had departed the caravan park where he had been staying for months. In July 2011 I reported on Kieber’s secret life on the Gold Coast as one of the world most wanted men, pursued by the Liechtenstein government as well as foreign crime groups. 8. October 2010: With Hannah Low, revealed first detailed account of the Australian Crime Commission’s suspected case against Paul Hogan and John Cornell, produced in Federal Court documents. It includes claims that Hogan and Cornell ripped off investors in the first Crocodile Dundee film; that they had a windfall profit of up to $180 million from a German media play in a secret Malta company; and that Swiss tax firm Strachans referred to them as “Client No. 1” and “Client No. 2” and provided them with European phones to stymie attempts by Australian authorities to tap their phones. Outcome: In September 2010 the Australian Tax Office had backed down from an order barring Hogan from leaving Australia, after News Corp Australian newspapers ran a protest campaign which saw the ATO back down. In November 2010 the Australian Crime Commission announced it was dropping its criminal investigation of Hogan and Cornell, but the investigation of their accountant continued. In May 2012 Hogan settled with the ATO after the Crime Commission won a legal case for access to accounts held by his lawyers and accountants. 9. August 2010: With Fiona Buffini, revealed that Andrew Forrest, who was leading the charge against the mining tax, had never paid income tax for his listed companies. While Forrest has donated more than $90 million in assets to his ACT charity –the then largest exercise in philanthropy in Australian history –the net personal cost to Forrest’s interests is probably less than $2 million. Outcome: Forrest’s Fortescue Metals Group paid its first income tax in 2012. Forrest continues to win accolades for his championing of Aboriginal employment. In October 2013 Forrest announced a $65 million donation to the University of Western Australia. It’s likely to be tax deductible. 10. October-December 2009: I worked with Tracy Ong and Angus Grigg on first story to reveal Labor powerbroker Eddie Obeid’s multi-million-dollar windfall from coal tenement awarded over his property in the Bylong Valley. After the initial story, by December Angus and I had mapped out most of the links to companies and people that would emerge in the 2012-13 ICAC investigation. I have company searches dated November 2009 that identified Cascade Coal, the Obeids’ Buffalo Resources, their advisors and lawyers and an indirect link to Australian Water Holdings, with a company search showing AWH directors included Arthur Sinodinos. 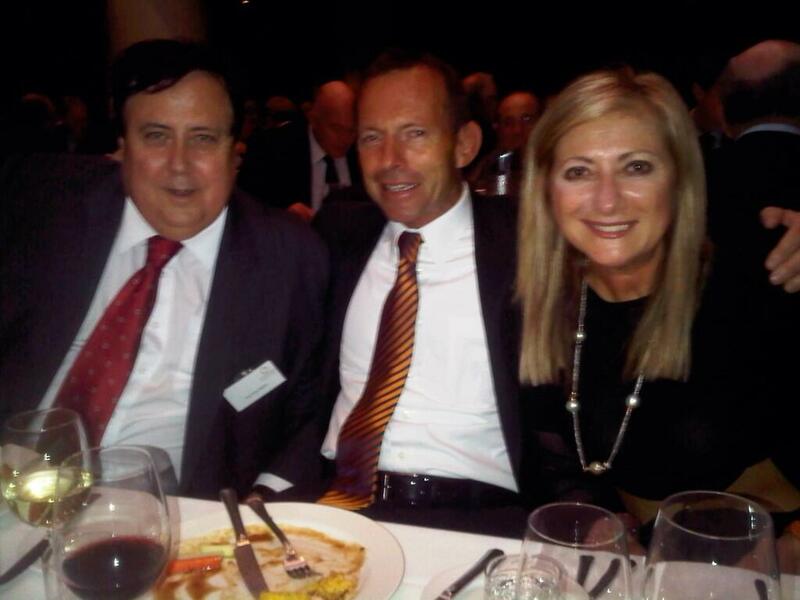 This was months before any other press coverage of Obeids’ coal interests. With legal barriers to further stories I wrote a Prince item, “Look inside Santa’s Coal Sack” which until 2012 was the most comprehensive guide to the Obeid deal. Outcome: The October 2009 revelation of Obeid’s coal windfall was a bombshell for state parliament. It was picked up by the Sydney Morning Herald in May 2010. In early 2010, given the legal difficulties AFR management decided not to pursue the story. The Prince item led to the Obeids setting up new holding companies for the deal with Cascade Coal. Counsel Assisting ICAC in 2012 suggested the Obeid coal scandal could represent Australia’s worst example of political corruption since the Rum Corps. Angus Grigg & Jamie Freed won the 2010 Business Walkley for their coverage of the deal to sell Cascade Coal and the Obeid coal tenement to White Energy for $500 million. 11. 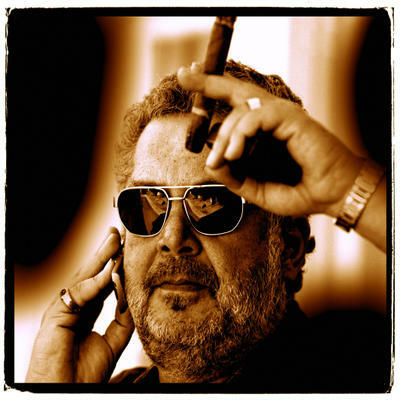 December 2008: With Shraga Elam revealed former Labor Cabinet Minister Graham Richardson instructed Swiss finance company EBC Zurich to transfer $1 million from an account linked to stockbroker Rene Rivkin over which Richardson had signing authority to a mystery Beirut account in December 2004. The story traced $4.6 million which had flown through the EBC Zurich account linked to Richardson, as proceeds from Offset Alpine and Abednego Nickel share trading. Outcome: The Australian Tax Office reopened its investigation of Richardson after having reached a settlement with him on the Swiss matters earlier in 2008. The Beirut account has never been traced. 12. June 2008: ‘Who Killed Opes Prime’ 10,000 words three-part series, definitive account of rise and fall of maverick share-lending operation. With Andrew White and Matt Drummond.Outcome: Walkey Business award 2008. Opes Prime directors Laurie Emini and Anthony Blumberg later pleaded guilty to charges of dishonesty. Fellow director Julian Smith was acquitted of a dishonesty charge in 2013.13. March 2007: With Angus Grigg reported Liberal Senator Ross Lightfoot, while acting president of the Senate used parliamentary privilege to launch two days of attacks on Swiss mining group Xstrata’s treatment of PMA, soon after he bought 1 million PMA options which he misreported. Outcome: Lightfoot lost preselection three months later. Was this connected? Debatable. But the story set the stage for revelations days later when Santo Santoro’s undeclared shareholdings forced his exit from parliament. 14. July 1995: I reported stock- broker Rene Rivkin’s apparent links to Swiss accounts holding Offset Alpine shares. In 1998 I revealed that Caroline Byrne, the fiancé of Rivkin’s driver, Gordon Wood, was found at the bottom of Sydney Harbour’s South Head the day after Rivklin and Wood were questioned by ASIC about the Swiss shares. 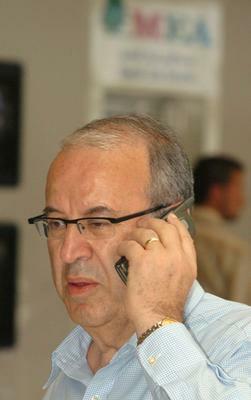 Outcome: Eddie Obeid lodged a complaint over the 1995 Offset coverage. 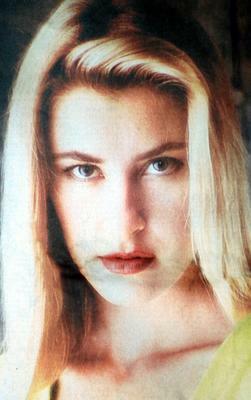 In 1998 Rivkin sued for defamation for four years. In 2002 Israeli journalist Shraga Elam supplied secret Swiss transcripts that linked Rivkin, Graham Richardson & Trevor Kennedy to the Offset Alpine Swiss accounts. years until conceding defeat by tax haven secrecy laws in 2010.
tion was overturned in 2012. 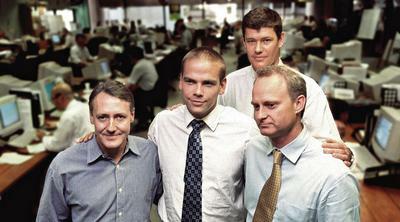 The 2002 coverage was awarded the 2003 Gold Walkley award together with Shraga Elam, Rosemary Graffagnini, Andrew Main, Colleen Ryan. 1. September 1990: I wrote a story for Australian Business magazine that concluded that Queensland Press, 52 per cent owned by News Corporation, was heading for a debt crisis as a result of a mystery 1987 deal with the Murdoch family. 2. September 1999: I queried the finances of One.Tel and noted its profits were based on changing the way its accounted for deferred costs three times in one year. Outcome: ASIC launched investigation which forced One.Tel to change how it accounted for deferred costs. This reduced its F2000 earnings by $173 million, taking One.Tel to a $291 million loss just as it revealed $13.8 million in bonuses paid to CEOs Jodee Rich and Brad Keeling. The furore left the company unable to raise further capital except from News Corp and Consolidated Press. One.Tel collapsed in early 2001. 3. November 2001: I reported that the birth of Wendi Deng’s daughter Grace had produced succession concerns in the Murdoch family. 4. 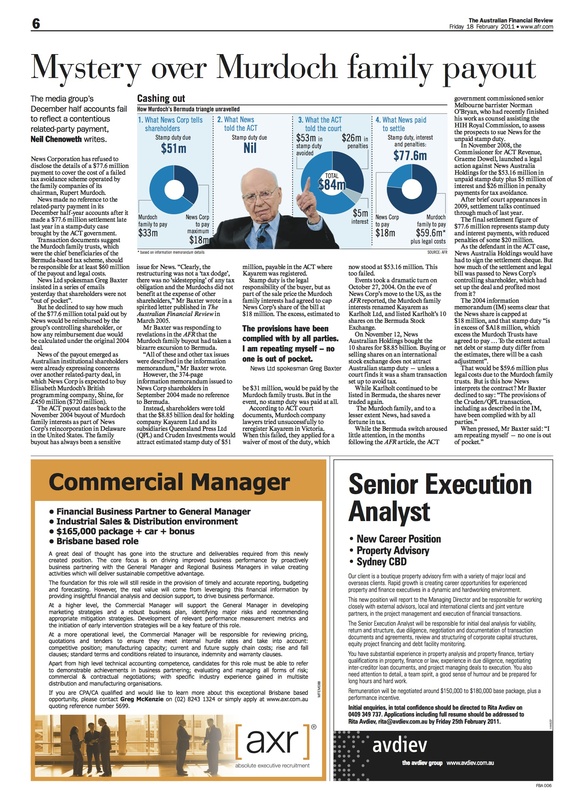 March 2005: I reported Murdoch family sidestepped tax by listing family company on Bermuda stock exchange then selling shares to News Corp. (the redoubtable Stephen Mayne filed this story the day before on Crikey. I had held off, after putting questions to News for comment four days before, offering them time to respond. The AFR pushed the story further and I was called by a barrister advising the ACT government on legal remedies. But no prizes for coming second). 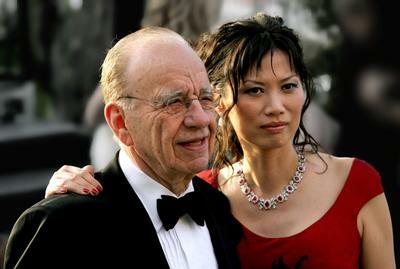 Outcome: I had noted that the report of the $A51 million tax saving coincided with news that Rupert Murdoch and Wendi Deng had bought a $US44 million New York apartment. News Corp execs complained that I was “out of control”. The ACT Government subsequently launched tax avoidance case against News. Settlement cost Murdoch family $A77 million in 2010. 6. August 2011: I revealed Italian court case in which a hacker paid by News International is accused of hacking satellite smartcards made by News Corp rival. 7. 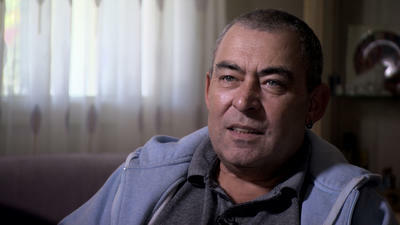 March 2012: I provided research for BBC Panorama program which interviewed whistleblower who ran Thoic.com, a UK piracy website funded by News Corp’s NDS arm, which distributed piracy codes for BSkyB rival ITV Digital. Eighteen hours later Australian Financial Review released many of 14,000 emails from hard drive of NDS UK security chief Ray Adams & details NDS Security operations in Australia, Italy, Germany, UK and North America. 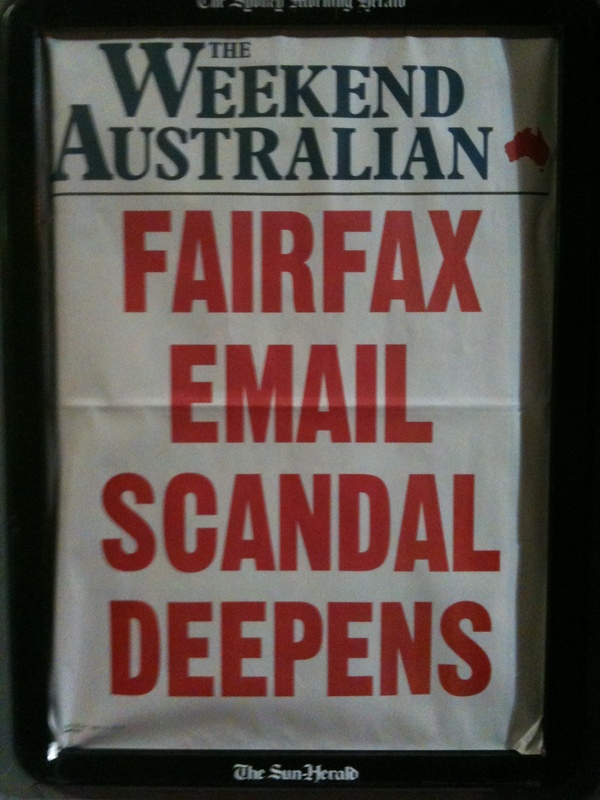 (1) News Corp Australia papers print rebuttals running to 20,000 words. 8. February 2014: I reported that the Australian Tax Office paid $882 million tax refund to News Corp after deciding not to appeal Court of Appeal judgement in July 2013. The payment increased the Australian Budget deficit at a time when News Corp papers were criticising “spending profligacy” of previous Labor government.